Edited by: Michael Bollig, Wilhelm J.G. Möhlig. 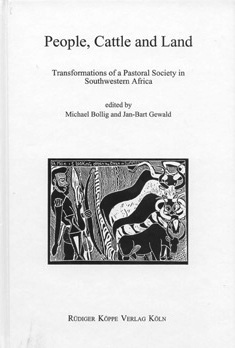 The present series is the medium of publication and forum for the Collaborative Research Centre Arid Climate, Adaptation and Cultural Innovation in Africa (1995–2007), University of Cologne. This series is meant to fulfil a double task: On the one hand, it will document source materials on cultural and historical change in Southern Africa, and on the other hand it will provide a forum for the discussion and analysis of such sources. Other traditions will also be considered in this series: local traditions of material culture and arts, of ethnography and historiography. The editors feel that there is an urgent need to publish oral accounts of these matters in order not only to record the history of precolonial processes and events but also to preserve the biographical remembrances of colonisation and oppression. The main goal is set upon publishing primary sources, i.e. oral traditions and documents written in local languages, official documents and hand-written testimonies so far hidden in private and public archives. The series is completed by volume 23. Author: Heinrich Vedder †. Translated by: Adi Inskeep †. Edited by: Adi Inskeep †. In collaboration with: Mathias Schladt †. Edited by: Thekla Hohmann. With contributions by: Susanne Berzborn, Gertrud Boden, Michael Bollig, Ute Dieckmann, Thekla Hohmann [show more…], Ina Orth, Steven Robins, Michael Taylor, Thomas Widlok. Author: Axel Fleisch, Wilhelm J.G. Möhlig. Edited by: Michael Bollig, Jan-Bart Gewald. With contributions by: Michael Bollig, David Crandall, Ruy Duarte de Carvalho, Andreas E. Eckl, Thomas Frank [show more…], Jan-Bart Gewald, Hildi Hendrickson, Dag Henrichsen, Tilman Lenssen-Erz, Giorgio Miescher, Wilhelm J.G. Möhlig, Itaru Ohta, Jeremy Silvester, Andrew B. Smith, Ute Stahl, Steven van Wolputte, Wolfgang Werner, Thomas Widlok, Christofer Wärnlöf. Author: Gustav Menzel. With a preface by: Wilhelm J.G. Möhlig. Edited by: Wilhelm J.G. Möhlig. With an introduction by: Wilhelm J.G. Möhlig. With contributions by: Michael Bollig, Andreas E. Eckl, Jan-Bart Gewald, Martina Gockel, Carmen Humboldt [show more…], Harald Sippel. Edited by: Inge Brinkman, Axel Fleisch. Author: Clara Mayer-Himmelheber, Dorothea Meyer-Bauer †. Author: Vilho Kaulinge †. Translated by: Dan Haipinge †. Edited by: Patricia Hayes, Dan Haipinge †. In collaboration with: Natangwe Shapange. With a preface by: Patricia Hayes.